Librarians and patrons in a typical larger urban public library. 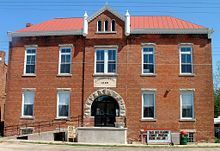 A public library is a library that is open to the public and generally funded by taxes at the municipal, district covering several municipalities, county, state, or federal level. Public libraries exist in most nations of the world and are often considered an essential part of having an educated and literate population. IFLA/UNESCO Public Library Manifesto 1994 writes "This Manifesto proclaims UNESCO's belief in the public library as a living force for education, culture and information, and as an essential agent for the fostering of peace and spiritual welfare through the minds of men and women." Public libraries are distinct from research libraries, school libraries, or other special libraries in that their mandate is to serve the public's information needs generally rather than serve a particular school, institution, or research population. Public libraries typically are lending libraries, allowing users to borrow books and other materials; they also have non-circulating reference collections. Public libraries typically focus on popular materials such as fiction and movies, as well as educational and nonfiction materials of interest to the general public; Internet access is also often offered. International Federation of Library Associations and Institutions (IFLA) and UNESCO presented IFLA/UNESCO Public Library Manifesto 1994 and recognized the value of public libraries in fostering spiritual values of all people regardless of social, economic, and cultural differences. In addition to print books and periodicals, most public libraries today have a wide array of other media including music CDs, computer software, movies on video tape and DVD, as well as facilities to access the Internet. Some public libraries use outside services, such as OverDrive, Inc. or OCLC's NetLibrary, to provide patrons with downloadable eBooks, audiobooks, music, and video. Public libraries may also provide other services, such as community meeting rooms, storytelling for infants, toddlers, and children, or after-school programs. In person and on-line programs for homework help, language learning and other community service programs are common offerings. One of the most popular programs offered in public libraries are summer reading programs for children, families, and adults. In rural areas, the local public library may have, in addition to its main branch, a mobile library service, consisting of one or more buses furnished as a small public library, serving the countryside according to a regular schedule. Public libraries also provide materials for children that include books, videos and DVDs, music CDs, and other materials (both fiction and nonfiction), often housed in a special section. Child oriented websites with on-line educational games and programs specifically designed for younger library users are becoming increasingly common. Public libraries may also provide services for other particular groups, such as large print or Braille materials, young adult literature and other materials for teenagers, or materials in other than the national language. Librarians at most public libraries provide reference and research help to the general public, usually at a reference desk but can often be done by telephone interview. As online discussion and social networking allow for remote access, references are becoming available virtually through the use of the Internet and e-mail. Depending on the size of the library, there may be more than one desk; at some smaller libraries all transactions may occur at one desk, while large urban public libraries may employ subject-specialist librarians with the ability to staff multiple reference or information desks to answer queries about particular topics. Often the children's section in a public library has its own reference desk. Public libraries in some countries pay authors when their books are borrowed from libraries. These are known as Public Lending Right programs. Many claims have been made for the title of "first public library" for libraries in various countries, with at least some of the confusion arising from differing interpretations of what should be considered a true "public library." Difficulties in determining what policies were in effect at different times in the history of particular libraries also add to the confusion. The early libraries open to the public in the West were the collections of Greek and Latin scrolls, which were available in the dry sections of the many buildings that made up the huge Roman baths of the Roman empire. However, they were not lending libraries. The "halls of science" run by different Islamic sects in many cities of North Africa and the Middle East in the ninth century were open to the public. Some of them had written lending policies, but they were very restrictive. Most patrons were expected to consult the books in situ. A selection of significant claims made for early libraries operating in a way at least partly analogous to the modern public library is listed below by country, then by date. In the early years of the seventeenth century many famous collegiate and town libraries—i.e., libraries under the guardianship of municipalities—were founded throughout the country. Norwich library established in 1608 (six years after Thomas Bodley founded the Bodleian Library, which was open to the "whole republic of the learned," and 145 years before the foundation of the British Museum) is said to be the first provincial town library under municipal control. However, similar claims are made for the Francis Trigge Chained Library of St. Wulfram's Church, Grantham, Lincolnshire which is said to pre-date the Norwich library by ten years, being founded in 1598 by the rector of nearby Welbourne. Other early town libraries of the UK include those of Ipswich (1612), Bristol (founded in 1613 and opened in 1615), and Leicester (1632). Shrewsbury School also opened its library to townsfolk. In Bristol, an early public library was that of the Kalendars or Kalendaries, a brotherhood of clergy and laity who were attached to the Church of All-Hallowen or All Saints. Records show that in 1464, provisions were made for a library to be erected in the house of the Kalendars, and reference is made to a deed of that date by which it was "appointed that all who wish to enter for the sake of instruction shall have ‘free access and recess’ at certain times." Although by the mid-nineteenth century, England could claim 274 subscription libraries and Scotland, 266, the foundation of the modern public library system in the UK is the Public Libraries Act 1850. Prior to this, the municipalities of Warrington and Salford established libraries in their museums, under the terms of the Museums Act of 1845. 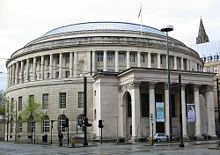 Manchester was the first library to operate a freelending library without subscription in 1852. Norwich lays claims to being the first municipality to adopt the Public Libraries Act 1850 (which allowed any municipal borough of 100,000 souls to introduce a halfpenny rate to establish public libraries—although not to buy books), but theirs was the eleventh library to open, in 1857, being the eleventh in the country after Winchester, Manchester, Liverpool, Bolton, Kidderminster, Cambridge, Birkenhead, and Sheffield. The Scottish-American philanthropist and businessman, Andrew Carnegie, helped to increase the number of public libraries starting in the late-nineteenth century. In his unconventional history The Tribes and the States, William James Sidis claims the public library is an American invention and states that the first town library was established in Boston, Massachusetts in 1636. The Boston Public Library still operates today.For an extended analysis of the origin of the U.S. public library see "Brahmins, BeQuests and Determined Women" in Introduction to Public Librarianship, Kathleen de la Peña McCook. The Library Company of Philadelphia was founded in 1731 by Benjamin Franklin and a group of his friends (the Junto) as a means to settle arguments. The subscription library was born. A subscription library allowed individuals to buy "shares." The money raised from the sale of shares went into buying more books. A member or shareholder then had rights to use the library. The Library Company, which may have been the first truly public library (members could actually borrow books), is still in existence as a nonprofit, independent research library. Scoville Memorial Library in Salisbury, Connecticut, the first free public library in the United States, was established in 1803. The New York Public Library in New York City, begun in 1849 and consolidated in 1901, one of the most important public libraries in the United States.Samuel J. Tilden, Governor of New York, 1875, and Presidential Candidate in 1876, was a lover of books. Tilden bequeathed his millions to construct the New York Public Library. He believed Americans should have access to books and free education if they so desired. The Williams Free Library became the first library in the United States to use open stacks when it opened in 1884. Scottish-American businessman Andrew Carnegie donated the money for the building of thousands of Carnegie libraries in English-speaking countries in the late nineteenth and early twentieth centuries. In 1747, construction began on one of Poland's first, at the time one of the world's best, national public libraries named the Załuski Library in Warsaw. In 1794, the library was looted on orders from Catherine II of Russia. Much of the materials were returned in the period of 1842-1920, but once again the library was decimated during World War II during the period following the Warsaw Uprising. The Załuski Library was succeeded by the creation of the National Library of Poland (Biblioteka Narodowa) in 1928. The Quebec Library, founded in Quebec City in 1779 by Governor Frederick Haldimand, was the first publicly-funded library in the country. It later merged with the Literary and Historical Society of Quebec, which displays the original Quebec Library collection within its library. Oakville Public Library is the public library system for the Town of Oakville, Ontario, Canada. It has six branches. In 1827, Oakville’s first library was established when William Tassie, the town’s first schoolmaster, opened a reading room in the meeting hall located on the site of the current central library. The first use of the name “Oakville Public Library” occurred in 1895. Between the 1860s and the 1960s, the library moved to four other locations in town, only to return to the Navy Street site in 1967 with the opening of the new Centennial complex housing the library and art gallery. Library services in Australia developed along very different paths in the different States, as such it is hard to define the origins of the Public Library system in Australia. In 1809 the Reverend Samuel Marsden advertized in England for donations to help found a 'Lending Library for the general benefit of the inhabitants of New South Wales'. The library would cover 'Divinity and Morals, History, Voyages and Travels, Agriculture in all its branches, Mineralogy and Practical Mechanics'. No public library came to fruition from this although some of the books brought to the colony after this call survive in the library of Moore Theological College. The place of public libraries was filled by mechanics' institutes, schools of arts, athenaeums and literary institutes. Some of which provided free library services to visitors; however, lending rights were available only to members who paid a subscription. In 1856, the Victorian colonial government opened the Melbourne Public Library (now the State Library of Victoria). This was however purely a reference library. In September 1869, the New South Wales government opened as the Free Public Library, Sydney (Now the State Library of New South Wales) by purchasing a bankrupt subscription library. In 1896, the Brisbane Public Library was established. The Library's collection, purchased by the Queensland Government from the private collection of Mr. Justice Harding. In 1932, the Carnegie Corporation of New York, funded a survey (The Munn-Pitt Report) into Australian libraries. It found 'wretched little institutes' which were 'cemeteries of old and forgotten books'. There was also criticism of the limited public access, poor staff training, unsatisfactory collections, lack of non-fiction, absence of catalogues and poor levels of service for children. Lending libraries in Sydney (NSW) and Prahran (Victoria) were praised as examples of services which were doing well, but these were seen as exceptions. In NSW, The Free Library Movement was set up on the back of the Munn-Pitt Report. This collection of (amongst others) concerned citizens, progress associations, Returned Servicemen and trade Unions advocated for a system of Public Libraries to serve the needs of all people. This movement was stalled by the declaration of war in 1939. The passing of Library Acts in the states at the end of the war marked the beginning of modern public libraries in Australia. In 1943, the Queensland Parliament passed the Libraries Act, establishing the Library Board of Queensland to manage the operations of the Public Library of Queensland, and coordinate and improve library facilities throughout the State of Queensland. In November 1943, at the official opening of the new Public Library of New South Wales building, William McKell, the New South Wales Premier, announced that the Library Act would be fully proclaimed from January 1, 1944. Even after the war, the development of free lending libraries in Australia had been agonizingly slow: it was not until the 1960s that local governments began to establish public libraries in suburban areas. 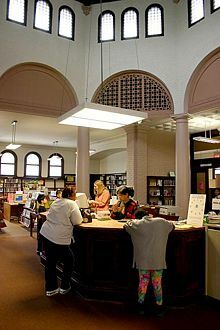 In the United States, among other countries, libraries in financially-strapped communities compete with other public institutions. Many communities are closing down or reducing the capability of their library systems. Jackson County, Oregon (United States), closed its entire 15-branch library system for six months in 2007, reopening with a reduced schedule. This example of a funding problem followed the failure to pass a bond measure and cessation of federal funding for counties with dwindling timber revenue, in a state with no sales tax . In December 2004, Salinas, California almost became the first city in the United States to completely close down its entire library system. A tax increase passed by the voters in November 2005 allowed the libraries to open, but hours remain limited.The American Library Association says media reports it has compiled in 2004 showed some $162 million in funding cuts to libraries nationwide..
Survey data suggests the public values free public libraries. A Public Agenda survey in 2006 reported 84 percent of the public said maintaining free library services should be a top priority for their local library. But the survey also found the public was mostly unaware of financial difficulties facing their libraries. The survey did not ask those surveyed whether they valued free library services more than other specific services, such as firefighting. ↑ IFLA/UNESCO Public Library Manifesto 1994. International Federation of Library Associations and Institutions (IFLA). Retrieved May 23, 2008. ↑ St. Wulfram's Church, Johnston Press Digital Publishing. Retrieved May 28, 2008. ↑ Anthony Hobson, "Open Shelves," TLS, 8, (December 2006), 9. ↑ Anniversary of first public library, BBC News, Thursday, September 5, 2002, 14:59 GMT 15:59 UK. Retrieved May 23, 2008. 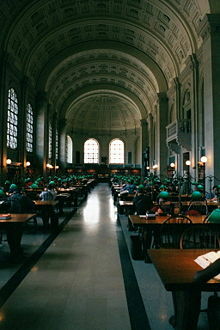 ↑ The Boston Public Library. Retrieved May 23, 2008. ↑ The Library Company of Philadelphia, The Library Company of Philadelphia. Retrieved May 28, 2008. ↑ Scoville Memorial Library, Scoville Memorial Library. Retrieved May 28, 2008. ↑ History, New York Public Library. Retrieved May 23, 2008. ↑ Maria Witt, Instructor, Paris X Nanterre. French culture overseas, Warsaw's Zaluski : "The Strange Life of One of the Greatest European Libraries of the Eighteenth Century: the Zaluski Collection in Warsaw". Retrieved May 23, 2008. ↑ Damian Mann. NOW WHAT? Levy backers say there's only one 'surefire' way to get the county's libraries reopened, Mail Tribune, April 8, 2007. Retrieved May 23, 2008. ↑ Damian Mann. Open, for now, Mail Tribune, May 23, 2008. Retrieved May 23, 2008. ↑ "Referenda Roundup, 2005" American Library Association, 2005. Retrieved May 27, 2008. ↑ "Library Funding" American Library Association, 2004. Retrieved May 27, 2008. ↑ "Long Overdue: A Fresh Look at Public Attitudes About Libraries in the 21st Century" Public Agenda, 2006. Retrieved May 27, 2008. Bill & Melinda Gates Foundation. Your Public Library Keeping Your Community Connected. United States: s.n, 2007. This page was last modified on 15 June 2015, at 19:07.